BREAKING: THE AVENGERS STRIKES AGAIN!!! 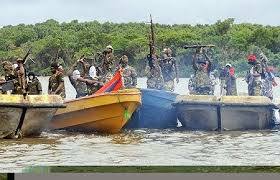 BLOW UP NNPC, NPDC AND CHEVRON OIL PIPELINES IN DELTA STATE. The Niger Delta Avengers at 10pm and 11:15pm respectively on the 5th of July, blow up the NPDC Manifold close to Banta and two PPMC/NNPC crude oil trunk Lines, as well as Chevron oil pipeline close to Otunana in Warri, Delta state. The group who uses twitter as its major means of communication, has seen their previous account suspended by twitter. However, this did not deter them from opening a new one and carrying out more deadly operation as reported today. 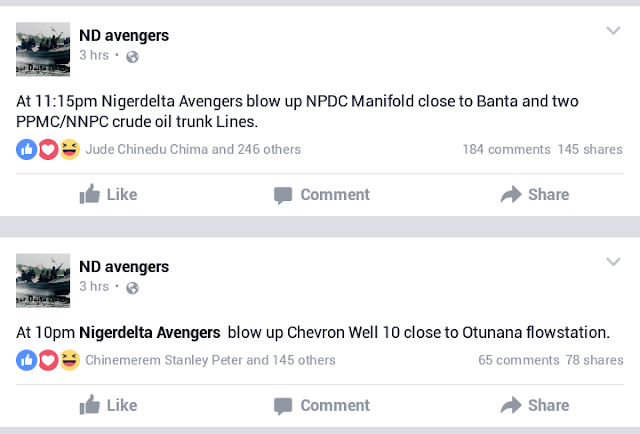 "At 10pm Nigerdelta Avengers blow up Chevron Well 10 close to Otunana flowstation. At 11:15pm Nigerdelta Avengers blow up NPDC Manifold close to Banta and two PPMC/NNPC crude oil trunk Lines." The Avengers has stated as part of their demand that the release of Nnamdi Kanu and every other IPOB incarcerated in various prison and army barrack remain sacrosanct and a pre-condition for cease fire. It is left for the dictator, Muhammadu Buhari to adhere to their instruction or meet his waterloo. As usual, we the indigenous people of Biafra under the leadership of Nnamdi Kanu will continue to pledge our allegiance to their mission, until the zooligical republic of Nigeria is neutralised and dismissed from world map. Nothing can hinder this mission from being accomplished, not even Buhari. Avengers. You are well done. But i am still expect the Missile as you people said. I want anything about that Nigerian come to any end. Please lunch your missile. I am waiting to see Nigerian come to any end. All hail all hail the kings avengers, well done, the God of Peace is with you, pls ride on. Pls don't betray us. Stand with your demand we are standing with you. NDA, you are God's Army. Fight on until you liberate your people and land and completely obliterate this evil, wicked and hell of a contraption called Nigeria from the face of this earth. Keep up the great work.